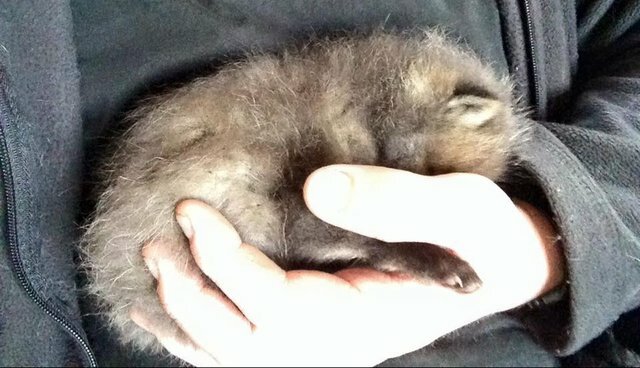 When a baby fox was found alone in a public park with no mother in sight, he was in need of help - so The Fox Man came in to provide it. The Fox Man is actually Paul McDonald, a local fox management consultant with Freshfields Animal Rescue in Liverpool, England. He deals with sick, orphaned and injured foxes on a regular basis and knew the ideal outcome for this abandoned fox would be to be reunited with his mother. When McDonald and his colleague first arrived on the scene, they tried searching the park for a fox den where they could return the cub to his mother. When one wasn't found, they turned to other measures. "We then left the cub in a box with a ventilated lid and a heat pad near a tree while we watched from a distance," McDonald told The Dodo. "[There were] no signs of foxes in the park up until 12 a.m., and so [we] took the cub with the intention of calling it a night." But not long after, a security guard at the park informed McDonald that foxes in the area are usually more active around 3 a.m. So, he tried again. McDonald ventured out to the park again that same night at around 1 a.m. and waited, yet again, to see if the cub's mother would appear. McDonald stuck around until 4:30 a.m, but, sadly, the cub's mother was still nowhere to be found. The next day, McDonald spoke to a member of The Fox Project, which is based in nearby Kent, who suggested it was worth trying one more time in case the mother turned up. But, after yet another night spent waiting, there still was zero sign of fox activity. That was when McDonald assumed the young fox had most likely lost his mother for good. "In any case, I think I put enough effort into reuniting them to at least feel comfortable about taking the cub in and having him rehabilitated to be released elsewhere," McDonald said. "It can be all too easy to remove a cub who is presumed to be an orphan, when in fact the mum has simply left temporarily, which is quite common with foxes." Unfortunately, McDonald did not have any other fox cubs the same age or size as the abandoned one. "I had to make the difficult choice to pass the cub onto another wildlife rescue so she could mix with other cubs and not be lonely," he said. The fox cub is now at the RSPCA's Stapeley Grange Wildlife Centre, where he'll have the opportunity to socialize and grow up alongside other rescued babies like himself. Want to help the Freshfields Animal Rescue continue doing good work? Consider making a donation here or sponsoring an animal here.